Protests about Fees at university. Qu: What is the exhibit about? I think they want NO FEES at all. The exhibit is about revisiting what the Freedom Charter is all about-Free education for all. There is the NFSIS option that struggling students can apply for in the meantime. 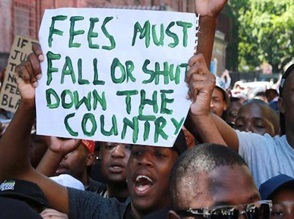 Qu: Do you think that #feesmustfall? Yes, I do agree with it but I recognise that it can't be immediate. It could be started by the government and worked at over time. Fee must fall but it cannot be free. How are you going to pay for it the lecturers and the course develkopment??? Don't you think that it should fall for those who are poor only. Is it OK to subsidise the rich as well? Don't you think those who can not afford university fees should rather go to TVET colleges? I empathize with students who can not eat well at the expense of having good education. Yes, I agree with you. We must do all we can to make sure people get a good education. Qu: Scan the QR code of the exhibit using your Quickmark app. Does the video portray the situation fairly? I think the video shows the students'side very well...but I feel it should also show how difficult this would be to introduce in a country where so few people pay tax and where the government isn't creating enough job opportunities. This would give one the 'whole' current picture. Qu: What format was more effective, the video or the photo? I thin the video as it shows the action and how widespread the uprising was. Also, the video is short so people will be interested in watching it. At whose expense should #feesmustfall? Maybe that should be a rephrase of the question. Yes #feesmustfall if there is commitment from all sectors of the economy to cut a slice from their budget to fund tertiary education especially for the indigent students and the less fortunate. Its concerns me, the country leaders and its citizenry are neglecting the gist of Ubuntu practice, which used to consciously and unconciously influence our nations, to dominate the concept of the richer that get richer while the poor remains in the same situation.